Hi, my name is Mark Elliott and as of the 1st June 2015 I am the Development Worker for The Feast in Bradford & Keighley. I am 29 years old and have been married to my beautiful wife Becki for 3 years. We live in Castleford in West Yorkshire and love spending time at our Church, The Salvation Army where Becki is the Children’s Team Leader and I am the Youth Team Leader. My parents are ministers for The Salvation Army, some of the pros and cons of this meant that they would move to a new Church every few years. Before settling in Castleford with my wife I have lived in Dumfries, Stornaway, Fife, Edinburgh, Aberdeen, Castleford, London, Wetherby and Nottingham! I am currently on my induction week in Birmingham and am enjoying meeting many of the inspirational people that work for and have contributed to the setup of The Feast. I am looking forward to bringing my skills to The Feast and beginning the job in Bradford & Keighley. I am excited and passionate about continuing the great work that Chris Reynolds started in Bradford & Keighley and getting to know both communities through working for The Feast. The Feast is honoured to share that we have received the Queen’s Award for Voluntary Service in the 2015 Queen’s Honours announced today. This is the highest award a charity or voluntary group can received in the UK. We have been recognised for our work connecting young people of different faiths and helping them learn how to build friendships, explore differences and make lasting change in their community. Founded in Birmingham in 2009, The Feast now operates in Bradford & Keighley, Tower Hamlets, Luton and Beirut in Lebanon, and specialises in youth community cohesion. The Feast is one of 187 charities, social enterprises and voluntary groups to receive the award this year. The number of awards handed out to groups have increased by over 60% from 2014, due to an increase in high quality applications, showing that the voluntary sector is thriving and full of innovative ideas to tackle community challenges. The Feast will receive the award from the Lord Lieutenant of West Midlands later this summer. “Receiving the Queen’s Award for Voluntary Service is a huge encouragement to everyone involved with The Feast. It is totally unexpected and we hope will raise up many more young people and volunteers to join us building more vibrant communities, despite our differences. As a part of our award Tim and volunteer Faraz Ahmed from The Feast were invited to attended a Royal Garden Party at Buckingham Palace on 20th May, hosted by the Queen and joined by other winners of this year’s award. This post was originally published on The Feast’s UK site. It was written by Canon Dr Andrew Smith, who Founded The Feast and Chairs the UK Trustees and the International Group. You can view the original post here. Steven Stanier and I have just returned from a trip to Beirut to visit the first expression of The Feast outside the UK. Our relationship with folk in Lebanon started at a conference in Beirut which led to the Istanbul exchanges in 2011 and 2012 between young people from the UK and Lebanon. Since then a group of youth workers in Beirut have been looking at how they could set up The Feast in their country. Sadly Lebanon is often only remembered for the civil war, which ended in 1990, and whilst there have been a number of peace building initiatives involving young people few have included faith discussions due to the complex nature of the situation. We’re so excited that the model The Feast has developed, of helping young people to share their own story whilst also listening to the accounts of others, enables faith discussion without it becoming politicised or sectarian. We were only in Beirut for 3 days but in that time managed to train the team of leaders and be part of a youth event involving Evangelical Christians, Maronite Christians and Sunni Muslims. The event took place in a sports centre and looked very much like an event run by The Feast here in the UK. They played lively team building games had a simple faith discussion (that led to some really good sharing of beliefs) and a meal at Burger King! To be in a country that only 25 years ago was at war along religious divides, and to see young people now able to sit and share what the best thing about being a Christian or a Muslim is, was humbling and inspiring. The group in Lebanon are going to meet every two weeks and are working in conditions very different to the UK so we have lots to learn from each other, as The Feast grows here in the UK and now overseas our hope is that we will become a family of movements inspiring, challenging and encouraging one another so that we can equip more and more young people to build friendships, explore faith and change lives wherever they are. I’m Tanya. I’ve recently moved back to Birmingham (for the third time!) and on 5 January I started working for The Feast UK as the Field Development Manager. While this has nothing to do with farming, I have moved to pastures new many times in my life. These experiences have been part of my journey and decision to join this team. Having worked in a variety of teams, environments and sectors, I have seen first-hand the beauty of diversity, but also the challenge it can bring. As a Christian, grappling with how my faith interacts with these different situations has been really important to me. I started to think about this when I was studying for a Physiotherapy degree at Birmingham University. How did my faith interact with my work in the NHS? Deciding that Physiotherapy was not the career for me, I moved on to an internship with a charity who spoke up about religiously-motivated violence around the world. My focus was on India. Feeling this was a little far away from the world that I lived in, I became a family support worker in east Birmingham with the hope of learning more about communities in Birmingham and the struggles many of them are facing. Wanting to be even further embedded in community, I moved to London and joined the Ladbroke Grove Eden Team which is a church-based team living and volunteering on a council estate in the west of the city. Alongside this I worked initially as a behaviour mentor in a secondary school and then moved to work as an account manager progressing to account management team leader for a company called The Key. The Key supports school leaders and governors. When I was planning a move back to Birmingham (to be nearer my boyfriend) I heard about this role at The Feast and loved that my background and experience could be brought together to support such great work. In fact, one of my previous colleagues said “only you could combine your love of eating with your faith”! 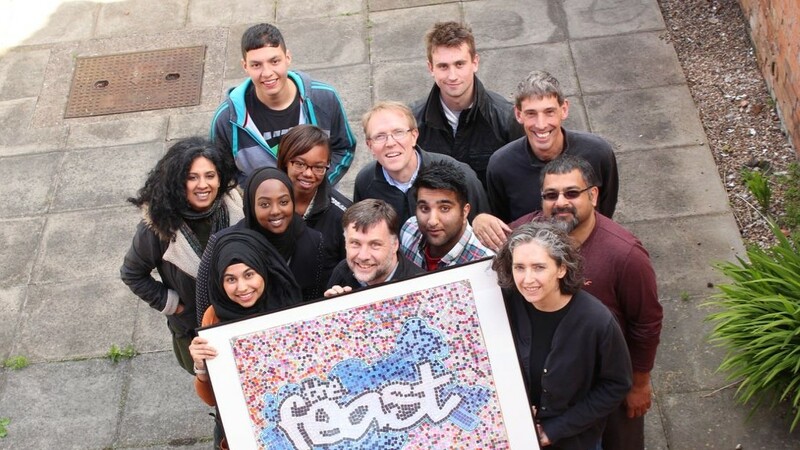 It is a real privilege to be joining this team and I am looking forward to the opportunity to support The Feast’s youth workers across the country to develop the great work they are already doing – and there is much for me to learn along the way!